Under slab vapor barrier, concrete vapour barriers are used under every slab that contains habitable rooms. Full stop! No ifs and buts. Depending on where you live, it is either illegal or just plain stupid to pour concrete without vapour barriers. I have just done a quick search on the web and to my amazement I find that some idiot has posted on Wikipedia something to the effect that vapour barriers under concrete are "controversial". Sure enough a few other sources (US) came up with the same thing. In 1965 the owner of a block of apartments asked me to look at the ceramic tiles lifting off his ground floor slab. After a quick look I told him that it looked like there was no vapour barrier under the slab. Wet season ground water was making the whole slab damp. I asked him who the builder was and he told me that he built them himself, he was a welder with no building qualifications, and no... he didn't use a vapour barrier. I told him that his best bet was to pull up the tiles (that would be easy for sure) and then paint the floors. Now the reason for that little story is that in 1965 everyone in the building game knew the benefits of using vapour barriers, and yet it seem that forty odd years later people are still arguing about it. Slab vapor barrier - A concrete pour under way, the concrete is being placed directly on top of the vapour barrier. Look at the pour above, the concrete is going straight onto the poly plastic. I have also seen on the web people saying that a layer of pebbles or gravel on top of the poly plastic, that's between the barrier and the concrete is the way to go. Total Garbage. The guys in the photo have just finished vibrating a section of fresh concrete, can you imagine the quality of the concrete if a few inches of loose dry gravel was mixed into the bottom layer? Vapour barriers are necessary for a few reasons. To stop undue dampness that can cause deterioration in the building structure. Undue dampness can also cause a loss of amenity for the occupants of the house. Smelly carpets and mildew everywhere. 0.2mm nominal thickness polyethylene film. Most rolls come with the thickness noted as 200um. Medium impact resistance. That means it should not get pierced easily before and during the concrete pour. It should be stamped continuously "AS 2870 Concrete underlay, 0.2mm Medium impact resistance." together with the manufacturer's name etc. So there is no problem for us, we just do as we are told and use the right material. 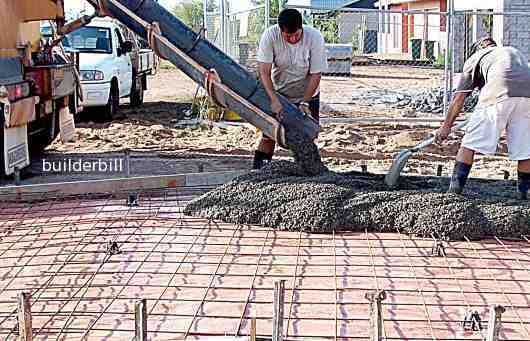 A material that can be easily verified by the building inspector before the pour. Notes about the thickness and quality. The metric system uses 0.2mm or 200um which is 200 microns or micrometers. Now you guys in the states use the measurement called a mil. This imperial system measurement is one thousandth of an inch. Being equal to 0.0254 millimeter. Many US government publications, call for the use of 4-6 mil minimum thickness polyethylene. (If you have a calculator handy and have worked out that 0.02mm is in fact almost 8 mil then it just goes to show the difference in standards around the world and one reason for my repeated warnings for you to check your own regulations). But more to the point, don't even consider 4mil thick stuff and if you can get 8mil or thicker so much the better. 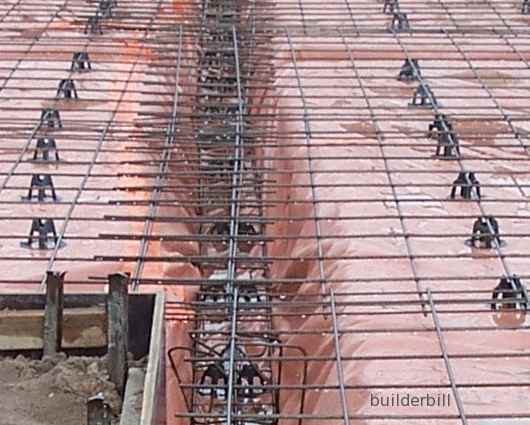 In the US it seems that the term vapor retarder is used quite a lot which is more or less suggesting that the term slab vapor barrier is not quite accurate. Which is right. To a certain degree all of these films will allow vapour to pass though. The difference is how much. Certainly many years ago manufacturers were coming out with cheaper poly films that used recycled poly and they were terrible. For a while the good guys advertised their products as be made out of "Virgin" poly. As I said before, it is easy for us here, we have no choices to make, we buy the the certified material for slab vapor barriers, even heavy duty, but in places where there are no clear cut standards, then all I can say is buy top class modern material. In the US you have the ASTM standard E 1745. Material that complies with this standard will set you back a fair bit more than the cheap crap going around, but in the scale of things compared to the rest of the job it is false economy to use cheap poly vapor barrier. There is one exception, see below. Slab vapor barrier - Another pour under way, this time the slab is a 100mm thick driveway. Apart from the barrier aspect of the poly layer immediately under the the concrete slab, there is the quality of the concrete to think of. The guys above are pouring a 100mm thick driveway. The BCA does not require underlay, but they are using it because it is good sound concreting practice. The poly underlay is a 0.2mm generic product that is cheaper than the AS 2870 material used under house slabs. With the underlay down the water in the concrete can not soak into the subgrade. If there were no underlay there, sure they could wet the subgrade down with a hose but that would be very hit and miss. Under vibration the sand bed gets mixed into the concrete when there is no underlay to separate them. This can degrade the quality of the concrete. When there is no poly barrier part of the water in the concrete soaks into the ground so the concrete tends to go off quicker and also in a patchy manner. In effect the concrete with the poly down is a known quantity and quality and these guys can get a large area laid and not worry about it going off in a patchy manner. Back to the code specifications again for slab vapor barriers, this time regarding fixing the underlay. Overlap all the joints not less than 200mm (8") and tape them with a continuous run of approved tape. Tape and seal with a close fitting seal around all the service penetrations. The vapour barrier must be placed under the slab so that the whole of the bottom surface is entirely under laid. It should follow the contours of slab thickenings (i.e. internal walls). The barrier should pass under any thickened edge beams or reverse kerbs and turn up outside to finish at ground level.